Lillian Vernon Exclusive. 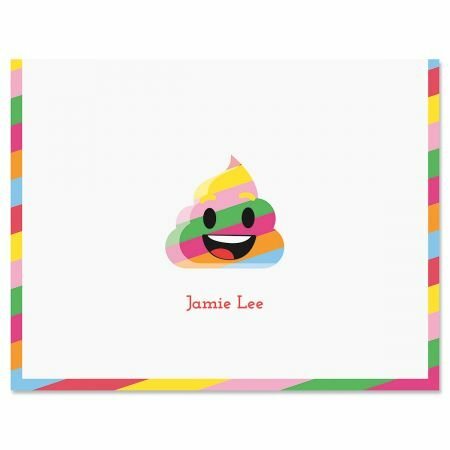 Personalized rainbow poop emoji note cards are something you don't need ? until you do. That's why they make a thoughtful gift that's destined to come in handy. This set of 24 notecards comes personalized. Stunning 4 1/4" x 5 1/2" blank-inside, personalized note cards and 24 white envelopes. We'll print your note cards with the name or message you choose. Ideal for thank you notes, invitations, and everyday correspondence. Comes in a cello bag with seal. Specify name up to 18 characters. Lillian Vernon Exclusive! Personalized rainbow poop emoji note cards are something you don't need ? until you do. That's why they make a thoughtful gift that's destined to come in handy. This set of 24 notecards comes personalized and comes in a cello bag with seal. Stunning 4 1/4" x 5 1/2" blank-inside, personalized note cards and 24 white envelopes. If you have any questions about this product by Lillian Vernon, contact us by completing and submitting the form below. If you are looking for a specif part number, please include it with your message.